A complex collision of at least four galaxy clusters is captured in this new image. Strange effects that have never been seen together before have apparently been produced because of this smash-up. This system has been dubbed "Pandora's Cluster" by astronomers because of all of the different structures found. Officially known as Abell 2744, this system is located about 3.5 billion light years from Earth. One of the most complicated and dramatic collisions between galaxy clusters ever seen is captured in this new composite image. 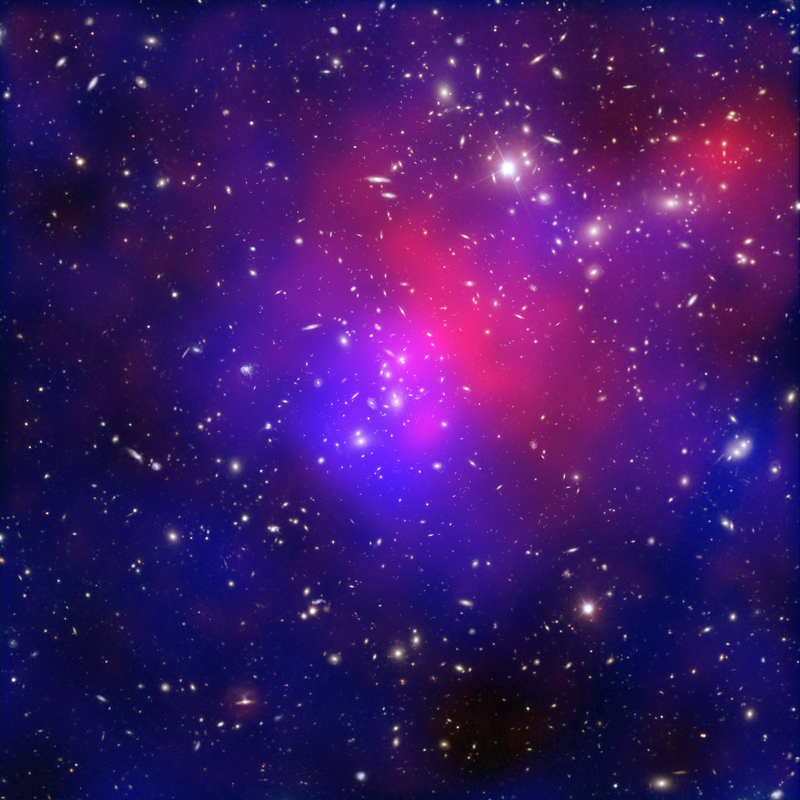 This collision site, known officially as Abell 2744, has been dubbed "Pandora's Cluster" because of the wide variety of different structures seen. Data from NASA's Chandra X-ray Observatory are colored red, showing gas with temperatures of millions of degrees. In blue is a map showing the total mass concentration (mostly dark matter) based on data from the Hubble Space Telescope (HST), the European Southern Observatory's Very Large Telescope (VLT), and the Japanese Subaru telescope. Optical data from HST and VLT also show the constituent galaxies of the clusters. 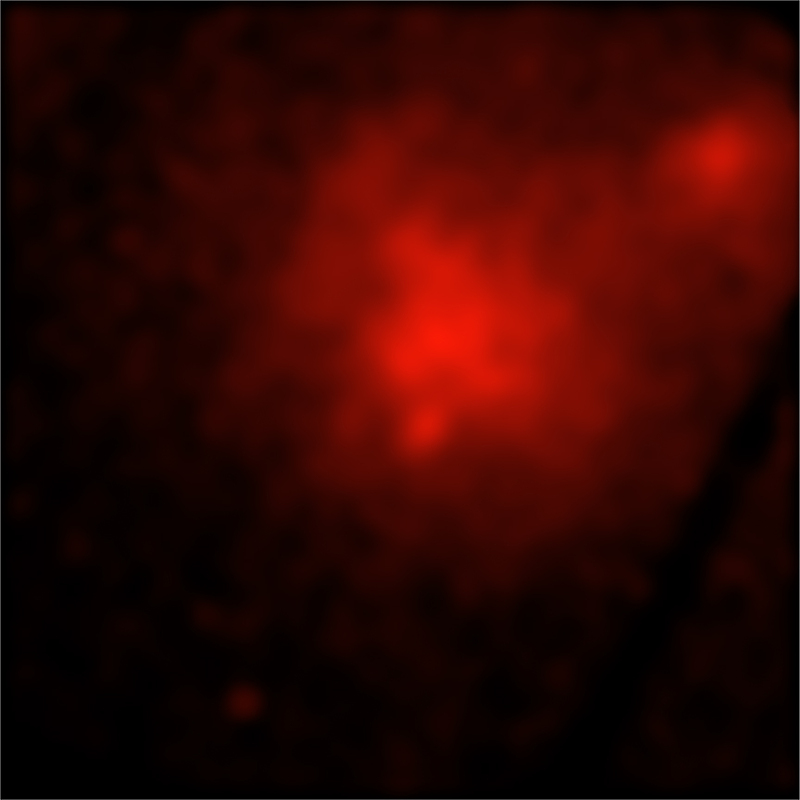 The "core" region (rollover mouse for labels) shows a bullet-shaped structure in the X-ray emitting hot gas and a separation between the hot gas and the dark matter. (As a guide, local peaks in the distribution of hot gas and overall matter in the different regions are shown with red and blue circles respectively). This separation occurs because electric forces between colliding particles in the clouds of hot gas create a friction that slows them down, while dark matter is unaffected by such forces. In the Northwest ("NW") region, a much larger separation is seen between the hot gas and the dark matter. Surprisingly, the hot gas leads the "dark" clump (mostly dark matter) by about 500,000 light years. This unusual configuration may require a slingshot scenario, as suggested previously by scientists, to fling the hot gas ahead of the dark matter during an earlier interaction. In the North ("N") and the West ("W") two additional examples of hot gas separated from dark matter may be visible. The latter appears to exhibit the largest separation seen to date between hot gas and dark matter. The authors of this study retraced the details of the collision, and deduce that at least four different galaxy clusters coming from a variety of directions were involved. To understand this history, it was crucial to map the positions of all three types of matter in Abell 2744. Although the galaxies are bright, they make up less than 5% of the mass in Abell 2744. The rest is hot gas (around 20%) visible only in X-rays, and dark matter (around 75%), which is completely invisible. Dark matter is particularly elusive as it does not emit, absorb or reflect light, but only makes itself apparent through its gravitational attraction. To pinpoint the location of this mysterious substance the team used a phenomenon known as gravitational lensing. This is the bending of light rays from distant galaxies as they pass through the gravitational field present in the cluster. The result is a series of telltale distortions in the images of galaxies in the background of optical observations. By carefully plotting the way that these images are distorted, a map is constructed of where the mass -- and hence the dark matter -- actually lies (shown in blue). Galaxy clusters are the largest gravitationally bound objects in the Universe and have become powerful tools in cosmology studies. Further studies of Abell 2744 may provide a deeper understanding of the way that these important objects grow and provide new insight into the properties of dark matter. Coordinates (J2000) RA 00h 14m 19.2s | Dec -30° 23´ 07.2"
There appear to be a lot of very linear groupings of 3 or more objects galaxies I presume. Is this just pattern recognition bias, or is there some explanation for this? God bless America if America will continue to disseminate science and knowledge. Light has energy and a force. According to Newton, every force has an equal but opposite force. The opposite of light is dark. Therefore darkness has a force and energy. I think light is the kinetic energy of darkness potential energy. Light energy is causing the accelerated expansion of our universe. Dark energy is greater than light energy. From the darkness comes the light. This is amazing, thank you CXC for this. That's an interesting idea. So if the universe expanded farther out of a distance than light could travel in the same amount of time then the universe including light itself was at one point traveling faster than the current cosmic speed limit - the speed of light. Perhaps we could recreate these explosions of epic proportions to travel faster than light. Hi, every night i dream about space and dark matter. If the great expansion at the creation of the universe expanded billions of miles in a very small amount of time then light must have traveled at the same time much faster than it douse now. Their was no known resistance to its out-wood journey but when dark energy was created could It have controlled the speed of light and slowed down the expanding universe kindest. The blue is the lensing map, so we abbreviated that under the image to LMAP just because of the limited space. My dream is to become a scientist, but due to poor funding, I am yet to achieve my dreams, I wish my dreams come true, I will forever be grateful to God. Does it really MATTER though? Scientists are still in the DARK about this... Get more ENERGY and research it now. I'd like to know more about dark energy. What an excellent opportunity to observe high energy physics. Article quotes "This unusual configuration may require a slingshot scenario, as suggested previously by scientists, to fling the hot gas ahead of the dark matter during an earlier interaction." Who or what made this happen? I wonder if weird space travel, experiments in the Large Hadron Supercollidor could have such intergalactic effects. What is the estimated number of galaxies in this mass? A complex collision of at least four galaxy clusters. About 3.5 billion light years from Earth. X-ray data from NASA's Chandra and Optical data from HST and VLT. 5.9 million light years across. X-rays are red, the optical data are yellow/white and the Lensing Map blue. In the constellation Sculptor visible in Southern Hemisphere.